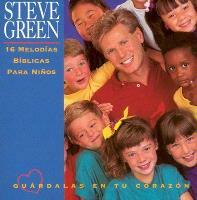 Steve Green brings his gentle presence and inspirational style to this Spanish album of biblical melodies for children. This is part of Steve Green's "Hide 'Em In Your Heart" series. Includes "En Ti Confio," "Dios Es Amor," "Hosana," and more! Steve Green trae su gentil presencia y su musica inspiracional en este album de melodias biblicas para ninos. Este album es parte de la serie "Guardalas En Tu Corazon". Incluye "En Ti Confio", "Dios Es Amor", "Hosana" y mas! For LYRICS please select the 'Buy' button. This will take you to the Store page. Then Select 'Details & Lyrics'. Scroll down and click on the song titles below for LYRICS and more DETAILS. Selecting the 'Buy' button on that page will take you to 'iTunes' where these songs can be purchased!